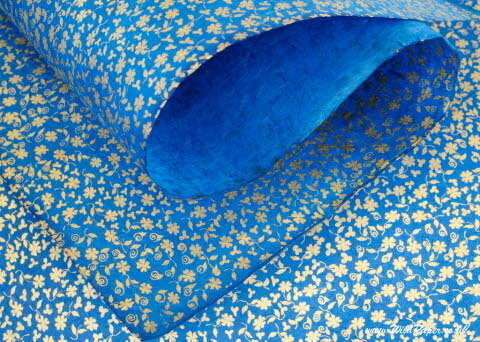 A brightly coloured Small Gold Flowers on Blue handmade gift wrap paper, with a screen-printed design of tiny gold flowers on royal blue lokta paper and based on the same design as our A4 craft paper. The sheets are medium-weight 30 inches by 20 inches - 55 gsm royal blue natural lokta paper, produced and printed in villages in Nepal. The reverse side is royal blue. Supplied Rolled and complete with a mailing tube. Price is for a pack of 3 fine quality unfolded sheets (20" x 30"each). Each sheet has deckled edges on 4 sides, with the variations typical of handmade papers.